Bunji at the Standard and the good folk at the Transport Blog have already posted on this issue but it is important and needs as much consideration as possible. In what appears to be a pre-emptive strike the Government has released various Cabinet papers detailing its response to the Super City’s aspirations. There are a number of papers but three that raised my interest were papers on the fiscal situation, transport and city form. The release is the political equivalent of a cold shower, designed to remove all sense of anticipation or hope. The papers are short but clearly targetted. The fiscal cold shower paper essentially says the Government cannot afford proposed PT investments including the inner city train loop. “Demonstrable affordability, practicality and achievability will be critical factors in obtaining buy-in to the plan from all stakeholders, including central government, and from the public generally”. Aucklanders would appreciate a debate about whether the Holiday Highway or the Queen Street tunnel should proceed but it appears that the Government does not want to engage in this debate. The return may be low but given the state of financial markets throughout the world it is fine. And privatisation would be hotly opposed by many locals. If Auckland acknowledges and reflects reality as understood by the Government then it may get funding. The transport cold shower paper essentially says that car use is going to continue to increase in the future and that Auckland’s investment in public transport, particularly rail is principled but misplaced. There is no mention of peak oil in the paper. There is no discussion how continuous increases in the cost of petroleum would ravage the transport system as we know it. Clearly the report anticipates business as usual and that current trends will continue. The spikes in oil prices in 2007 and more recently have not attracted the paper writer’s attention. If oil does continue to increase in price then the business as usual presumption is going to be turned on its head. In three years time we may look at Britomart as the rail system has reached capacity and wish that we had leadership that made sure that its capacity could increase. We also need good effective broadband and a strategy to persuade businesses to allow their employees to work from home one day a week. These considerations did not make their way into the cabinet paper. The final cold shower paper is about urban form. Environmentalists have always advocated for a “compact city” model. A compact city means less driving for its citizens and greater use of public transport as well as the greater preservation of forests and arable land surrounding the urban area. The report states clearly that Auckland’s regional growth strategy is not working in that intensification developments are lower than forecast and greenfield development is higher than forecast. There is no attempt to say whether the lack of intensification is good or bad, just that it has not happened. There is also expressed the hope that everyone can agree about development. “Successful spatial plans build widespread consensus among public and private sector stakeholders. A high degree of investor and developer buy-in to the strategic direction is crucial to success, but is challenging to secure. Investors need to see a strategic direction that is feasible and backed by a set of regulatory and funding measures (e.g. district plan rules and development contribution policies) that will work, and provide them with the incentives they need to invest in ways that support the strategic growth model. And what will happen to the Metropolitan Urban Limit? This has been put into place to stop Auckland from growing continuously. The report says the MUL “appears to have been instrumental in the lack of private sector support for the growth concept.” Obviously the Government want it to go. 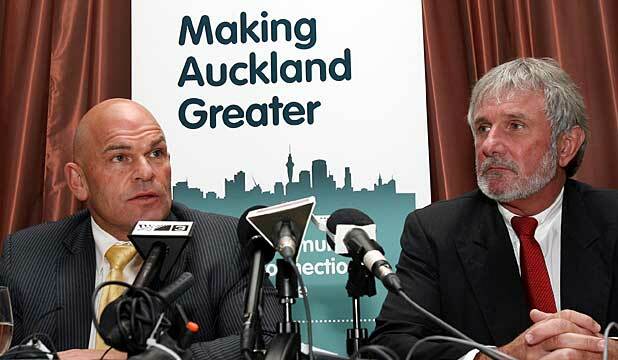 The overwhelming message is that if Auckland city want Government support then it had better tow the line. And this line is a car centric urban sprawling developer mandated vision for our biggest city.